【C】 During your turn, all your other 「可愛らしい来客 千紗希」 gets ＋2000 Power. 【A】［Place 1 card from Hand into Waiting Room］ When this card is placed on Stage from Hand, you may pay the cost. 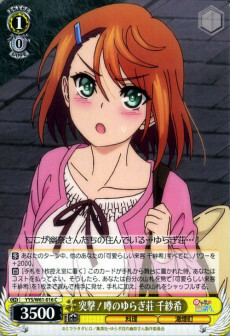 If you did, search your Deck for up to 1 「可愛らしい来客 千紗希」 and show it to opponent, add it to Hand, shuffle your Deck afterwards.